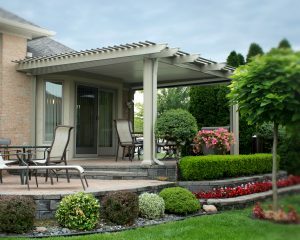 Princeton, New Jersey, homeowners can rely on SRA Home Products to skillfully install top-of-the-line patio covers. We proudly carry patio covers manufactured by TEMO, an outdoor living company that’s worked with more than 100,000 customers nationwide. St. Thomas — Our St. Thomas patio covers feature curtain walls that can hold optional retractable screens. If you enjoy dining outdoors, but hate having to deal with mosquitoes and other annoying pests, you’ll love being able to pull down these screens to keep the bugs outside. Santa Fe — Our Santa Fe patio covers include the curtain walls that come standard with the St. Thomas model. 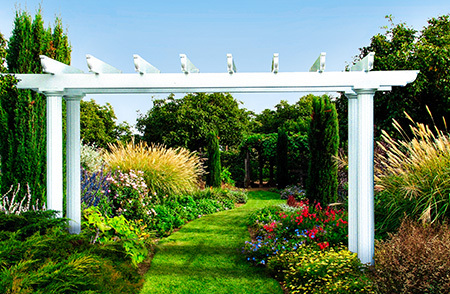 What distinguishes the Santa Fe covers is that they also include pergola trim along the perimeter of the roof. 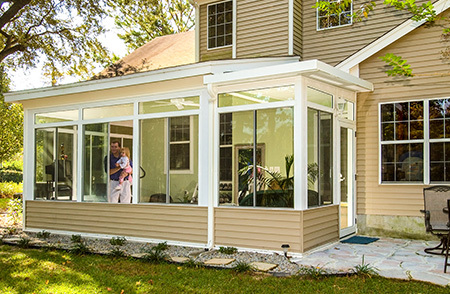 Sunlight pavilion — Our sunlight pavilion patio covers feature a polycarbonate roof that allows sunlight to pass through, making it an ideal option for homeowners who enjoy reading outside but want to avoid dangerous ultraviolet rays. The polycarbonate roof is available in three standard colors and virtually endless custom colors. Once you’ve decided on the style that will work best for you, you can also choose the color (white or sandstone) and the column style (Florentine, Roma, or Venetian). If you’d like to learn more about our selection of patio covers, contact SRA Home Products today. One of our friendly team members will provide you with additional information, answer your questions, and help you schedule a complimentary consultation at your Princeton, NJ, home. We look forward to working with you.